What gives more detailed images (higher resolution) – an iPhone or the COBE satellite camera used to propel Big Bang into the leading Cosmology concept? News Flash: (June 17, 2012) This article was just voted one of the best science blog articles of the past year at 3-Quarks Daily. Thank you for your votes. Here’s a hint. This first photograph of the mystery phenomenon is presented with the same angular resolution as the camera on the COBE satellite: Cosmic Background Explorer – Differential Microwave Radiometer (COBE-DMR). The COBE satellite’s data / images were described as “echoes of Big Bang” and used to first claim cosmic microwave radiation is purely from “background,” not from stars or galaxies or space dust or gas. 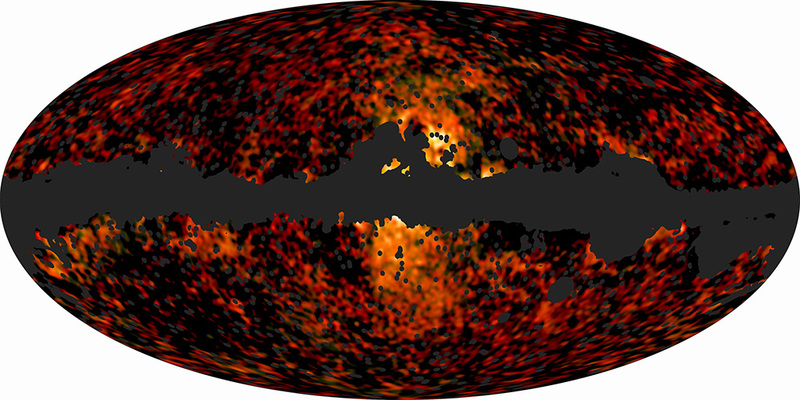 COBE’s “background” radiation map was used to eliminate the “ Steady-State” cosmology – Big Bang’s popular competitor at the time. Can’t see anything? Try this sharper version of the same image with a resolution identical to the best NASA technology (WMAP) for cosmic microwave radiation. Can you guess what it is yet? or is it still too obscure? Well, when you are ready – lets take a look at it with the resolution of an ordinary camera. You’ve got it – all three are the same image of our moon during the December 2010 Lunar Solstice Eclipse. The first eclipse image was resized to the same resolution as the COBE DMR camera used to make the original claim that Cosmic Microwave Radiation is a “Background” radiation glow from Big Bang. The COBE camera’s angular resolution was horrible; only about 7 degrees per pixel, while our Moon appears about a half a degree wide, meaning each gigantic COBE pixel is 14 times wider than our Moon as we see it from Earth. To represent the resolution of the COBE camera the first eclipse image had to be resized to a single pixel for the entire image (and even that was slightly too generous because the original Eclipse image was not quite 7 degrees wide). A single COBE pixel gathered all the “light” (microwave radiation) from the whole 49 square degree (7 degrees times 7 degrees) field of view and averaged it to give you only a single data point. “Statistics are like bikinis. What they reveal is suggestive, but what they conceal is vital.” ~Aaron Levenstein. We’re going to take a look at how low resolution microwave images conceal a lot of foreground radiation. This is similar to how the low resolution versions of the eclipse images (above) take the bright light of the moon and add it to the black of the surrounding sky beyond (and all the stars and galaxies in the field) and “average” it all to give a result as a single pixel. That means a single data point, covering the whole 49 square degree view of sky which is many times the size of the moon at 0.2 square degrees. Of course since the image is only one pixel – whatever the brightness is – it can only be one color and one brightness value. Although the first image appears simply black, it is not. Pure black would be zero (0) out of 100 percent on the brightness scale. Because of the light from our moon and a few stars are mixed in, that single pixel measures brighter than black at about one percent of full brightness: Red=0.8 percent, Green=0.2% and Blue=1.0%. Our whole sky has 41,253 square degrees. This means you can make a whole sky brightness map with only 841 total COBE pixels (29 x 29). That’s less than a kilobyte of data to show the entire night sky. To represent the resolution of the sharpest WMAP camera the image was resized so that the moon is 2.4 pixels wide. While we can now distinguish the moon from the background because the pixels are smaller than the Moon’s diameter – individual stars that we can see in the digital camera version are still invisible to WMAP. That’s because compared to WMAP’s resolution stars are too small (smaller than a pixel) and thus are “averaged” away; essentially mixed together with lots of “black” beyond, losing their individualness. This means that even though WMAP could distinguish (about 8 pixels worth of) Moon microwaves from the background it simply did not have the angular resolution needed to distinguish microwaves from any individual star or galaxy (except our own Milky Way galaxy, which surrounds us, and a few neighboring galaxies such as Andromeda which is about 2.5 degrees wide). Now you can tease out a bit better data by cleverly using lots of overlapping images, but that’s the sharpest angular resolution for NASA’s Cosmic Microwave Radiation technology as of May 2012. Angular resolution will improve later this year or in early 2013 when the European Space Agency’s PLANCK Satellite releases whole sky microwave radiation data with its best angular resolution almost three times as sharp as WMAP (5 arc-minutes vs WMAP’s best at 13.5 arc-minutes). The only cosmic microwave background experiment with resolution better than Planck’s is “Acbar” a ground based telescope that achieves four (4) arcminute resolution. Update: Since I had a couple of very bright folks ask about distinguishing between angular resolution and sensitivity I’ve added this: Sensitivity and resolution are related but independent phenomena. A telescope or a camera’s angular resolution is measured in pixels per degree of sky. It is mostly determined by its sensor and pixel size and its lens focal length. Telephoto lenses give higher angular resolution, as do more pixels. A telescope or a camera’s sensitivity (in this case) is how faint a signal each pixel can detect. It is determined by the quality of the individual pixels/sensels. As a generality a large pixel captures more light / radiation; thus can pick up fainter signals. COBE and WMAP microwave cameras were designed almost purely for high sensitivity with huge “pixels” – not for angular resolution. (COBE’s DMR camera only had two (2) pixels. That is not a misprint. COBE cameras did not have mega-pixels or even kilo-pixels – just two pixels total. Amazingly even the very first digital camera built in 1975 had thousands of times more pixels (at 100×100) than COBE.) While it is an understandable design choice, it appears that ignoring angular resolution leaves a bit of a problem. One way to find the angular resolution of a camera is to divide Pixel size in microns by Focal length in millimeters. Then multiply that times 206.3 which gives you “arc seconds per pixel.” At the iPhone4’s 35 mm camera focal-length equivalent of 29.4 millimeters (3.85 mm actual) we get 94 arcseconds per pixel. This means the moon is about 19 pixels wide in an iPhone4 photo. NASA has already done this for COBE (7 degrees = 12.7 moons / COBE pixel or 0.0786 pixels / moon diameter) and WMAP (~2.4 pixels / moon diameter) so we don’t need to calculate much. Perhaps because of our familiarity with spectacular Hubble images and affordable digital cameras with high resolution we take extremely high resolution images of our Universe for granted. However, for Microwaves, high resolution whole sky images simply do not yet exist. As we’ve seen microwave telescope’s stunningly poor (almost meaningless) angular or detail resolution is dramatically worse than common visible light cameras. Cosmic Microwave Radiation – How much is really Background? As a cosmology aficionado, you’ve certainly heard of Cosmic Microwave Background Radiation. But did you ever wonder how they decide which microwave radiation is background and which is foreground? In short, the primary method is to start with whole sky microwave radiation maps (which were never available until the 1983 Russian spacecraft “Relikt” – six years before COBE launched) then subtract the known foreground microwave radiation. Whatever is left, they call “background” — Cosmic Microwave Background Radiation. Definitions: Whole sky microwave radiation is easy to discern (it is all non-earth based microwave radiation). Foreground microwave radiation is defined as the microwave radiation coming from anything made of normal matter (solids, liquids, gas and plasma) which includes all the galaxies, stars, gas and dust. Even microwaves from the most distant galaxy, gas cloud or star are foreground radiation. The biggest contributor of foreground microwave radiation, by far, is our own Milky Way galaxy which you can see as the broad red band in this whole sky map. Background microwave radiation is not clearly defined, other than — all microwave signals left over when you subtract the foreground. While that doesn’t seem like an fully adequate definition, we’ll use that for this article. Well, there are a few problems with this foreground subtraction method that are not widely appreciated outside the microwave astrophysics research community. To start with some context, we know with certainty foreground microwave radiation exists because it shares virtually identical locations and density (flux) patterns as our Milky Way in visible light and every other wavelength including radio waves, gamma rays and x-rays. Further, (in theory) you can just put out a microwave camera (in orbit) and get a map of foreground radiation. No calculations are needed at all, just take sky pictures in the microwave band and map them. While foreground microwave radiation clearly exists, an indisputable inventory of all its locations does not – partly due to the low resolution of microwave telescopes and cameras, partly because there is no unambiguous definition of a “background,” and partly because different teams use different “models” and methods to subtract foreground. Here’s one of the most recent (2010) whole sky microwave radiation images (from Planck) that illuminates our Milky Way’s “calculation-free” Foreground microwave radiation. Everything Blueish-White is Foreground from our Milky Way. However, by contrast, we do not have anywhere near the same assurance that there is any background microwave radiation because you simply cannot take a picture of it, you have to calculate it. Those calculations are massively complex and based upon often hidden assumptions. To subtract out the foreground requires choosing one of several elaborate computer models with highly complex calculations (not to mention an armload of assumptions) of what is foreground and what isn’t. Then it takes extraordinary amounts of effort and computer time to arrive at a background map (COBE software took 5 months to process only a year’s data). In short, Cosmic Microwave Foreground is a photograph of microwave radiation, while Microwave “Background” is really only a statistic derived from a complex computer model with a lot of large assumptions. Poor Angular Resolution is one of Background CMR’s biggest problems. COBE and WMAP cameras do some things marvelously (like measure exquisitely faint radiation signals), but that’s for another article. However as described above, Cosmic Microwave Radiation “cameras” have remarkably poor resolution; some 200 times worse resolution than an iPhone4 and thousands of times worse than a good digital camera. If we want to subtract the radiation of foreground stars and galaxies (and gas clouds and dust) to see what remains as “background” microwave radiation — we need to know very precisely where all the foreground sources are, and how much and what kinds of microwave radiation they emit. However, when we are stuck with poor angular resolution we can’t really identify all the distinct sources of foreground radiation or its edges so we can separate it from the background. Think of the Hubble Ultra-deep field images that are overflowing with tens of thousands of galaxies we’ve never seen before – all unarguably spewing microwaves; just like our home Milky Way (at least 30,000 to as many as several million galaxies in every square degree of sky). 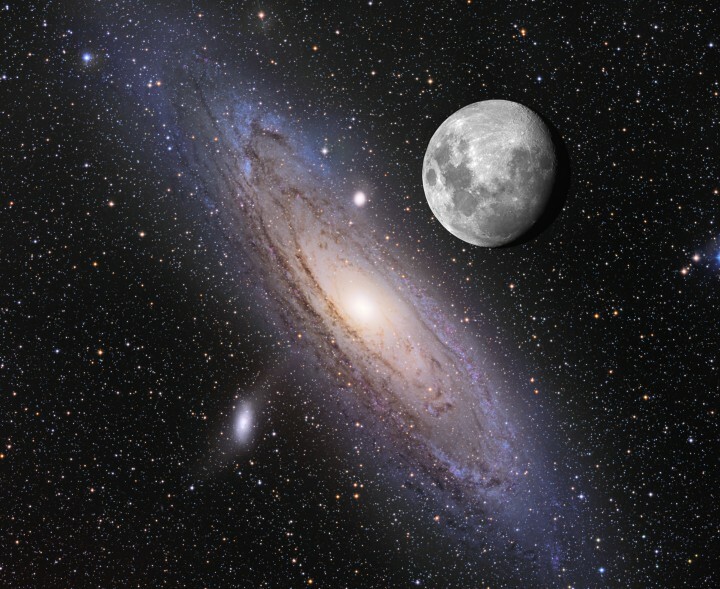 The only galaxies we have a fairly good idea of how much, where, and what kind of Microwave radiation is emitted is our own Milky Way and to a much smaller degree, our neighbor Andromeda. This is precisely because our best cosmic microwave radiation instruments (Planck, WMAP and COBE) have such poor resolution that we simply cannot really measure microwave radiation from even our closest neighbor galaxies such as Andromeda – without having the radiation from at least thousands (if not millions) of other stars and galaxies added in. We only recently found out our home Milky Way’s microwave halo glow extends many times broader than the map area of visible stars. The key point is – when your angular (detail) resolution is so poor that you can’t distinguish stars and galaxies from background, even if your sensor is hyper sensitive — sensitivity is irrelevant. This is not unlike inviting an attractive stranger for dinner and they refuse to come unless they can bring their parents . . . and friends, and in-laws . . . and outlaws and essentially everyone they’ve every met. Then you can’t see your date, you can only hear them (an ear’s angular resolution at about 15 degrees is only about twice as poor as COBE’s camera). Imagine trying to pick out what your date (microwave background) is saying from out of all the thousands of other conversations (galaxies) of your date’s entourage. The key idea is: if your angular resolution is poor enough – everything looks like background, even if every single photon comes from specific sources. In fact, the amount of sky real estate considered “Background” has been diminishing in jumps since the first whole sky microwave map from Russia’s RELIKT-1 surprised researchers by showing huge areas of microwaves coming from our own Milky Way. Newer technology’s better angular resolution cameras show a growing percentage of the microwave radiation sky area that was previously considered “background” is really just from our own galaxy. This year ESA’s Planck satellite just discovered a huge foreground microwave radiation “haze” from our own Milky Way galaxy that covers at least two-thirds of the sky, and perhaps as much as 75 percent. Now compare this new (2010) whole sky microwave radiation image from Planck that includes our Milky Way’s microwave radiation. Everything blueish white is foreground from our Milky Way. The red areas at the top and bottom are what’s left after subtracting out our Milky Way (but not any distant galaxies, dust or gas clouds). Do you see how our Milky Way’s microwave (foreground) area is so much bigger on the newer and higher resolution map? What do you think of this poor angular resolution; and how does it affect your ideas on what is foreground and background? Do you think that the WMAP (or COBE) cameras can provide undebatable evidence that cosmic microwave radiation is not from our own galaxy or any galaxies in the background? How? As space-based microwave cameras get higher resolution how do you think the “background” radiation maps will change? I look forward to your thoughts. PS Just for fun (oops, I meant for comparison) – here’s probably the highest quality (visible light) map of our Milky Way galaxy in a whole sky map. It was painstakingly made by Axel Mellinger I happily urge you visit his website to take a detailed look at our own galaxy. 1. A individual camera “pixel” is termed a “sensel” by camera engineers. This entry was posted in Basic Astrophysics, Basic Science, Big Bang Models, Cosmic Microwave Radiation, Definitions, Education, Fun and tagged angular resolution, Big Bang, CMBR, COBE, Cosmic Microwave Foreground, foreground microwave radiation, Hubble ultra-deep field, iphone, NASA, PLANCK, poor angular resolution, sensor sensitivity, subtracting foreground microwaves, WMAP. Bookmark the permalink. It does seem a formidable challenge (understatement intended) to sort out “background” from “foreground” radiation, especially given the limitations of the instruments in use. What do you make of the fact that the background angular distribution fits the inflationary big bang calculation so well? Thank you for your thought Josh. You asked how does “the background angular distribution fit the inflationary big bang calculation so well? Well, first I’m not convinced that we know where the background is. There seems to be more “background” (or less foreground) towards our galactic poles, but even that is suspect – because the instrument angular resolution is so poor – every square arc-minute of microwave radiation could be purely from very distant galaxies as opposed to what Big Bang requires — a general diffuse background radiation never emitted by, or interacting with, matter. As I tried to point out in the article, until we know where all the foreground is with some reliability – we can’t credibly subtract it from the total to get a “background” microwave map. Since the amount of “background” area has decreased significantly with every increase in microwave instrument resolution – I wonder how much, if any, will be left when we get microwave instrument resolution similar to Hubble’s 0.1 arc-second. If some foreground areas are still being counted as background (as the new Planck maps are showing) – that foreground is wrongly used to make maps and graphs that are the basis of all the background claims including angular distribution / inflation calculation as well as blackbody fit and anisotropy maps. In addition, there’s the problem with a microwave “Cold spot” on the “background” maps that defies explanation using Big Bang or Inflation models, and the Quadrupole moment which is apparently smaller than predicted. I prefer to stay skeptical until we have whole sky maps of microwave radiation with resolution approaching the size of the galaxies we can see in visible light which unarguably emit microwave radiation. Then if the “background” remains – I’ll be happy to take a new look at it. Loved your article David! Interesting, comprehensive and Fun! I’m delighted you found it fun ! Very interesting article! It literally opens up new worlds to my eyes! It is amazing that ICY radiation can be so beautiful! I’m pleased it helps bring you new worlds. Fascinating article! I enjoyed reading this very much. it occurs to me that photographers might understand this easily. Our amazing friend, David Dilworth, on top of all else he does for our community, continues to work on the greater community of the entire cosmos! Thanks for sharing the article and this cool web site with us. Thank you for your kind thoughts Anna. What about other microwave instruments like Acbar and Boomerang? Isn’t their resolution similar to Hubble’s? It shows that Planck and WMAP are the only whole sky instruments with resolution better than one degree (60 arcminutes). The highest resolution instrument of all (Acbar) has four (4) arcminute resolution. Its the only camera with resolution better than Planck’s 5 arc-minutes. Acbar is a Ground based telescope so it can’t really make a whole sky map. None of the non-spacecraft can do whole sky data. Is there a physical limit to the resolution that one can achieve with microwave? Are there instruments in the pipeline which can improve the resolution towards this limit? Thank you for your questions Mike. I am not an expert on the limits of microwave technology, nor am I aware of what microwave telescope technology is in our future. However, maybe one of our readers can help. I can give you a general answer for high resolution telescope optics. The world’s highest resolution telescope is the Very Large Array (VLA) which apparently can collect microwave data with arc-second resolution. Because it is ground based it cannot give us a whole-sky image. nevertheless, that is a big leap forward. We have all the technology and know-how to put several microwave telescopes in orbit separated by a thousand kilometers using the same technique as VLA. That should get us sub-arc-second microwave images of nearby galaxies and other fascinating phenomena. I want to see what turns up when we aim them at the same location as the Hubble Ultra-Deep Field. I appreciate a great mind that writes with an expanded conciousness. Keep it up! I just found your blog, and I’m loving it! I’m not a physicist, but I enjoy reading new discoveries and research in Physics and Cosmology. I’m very surprised and wondering why I didn’t notice the resolution problem myself. I took for granted that physicists putting forward the data they call the CMB would have taken the microwave information from our own galaxy and the others we know of and calculated it out before putting that out as an actual image. I assumed they had the microwave data or a reasonable model of it in order to calculate that information out before they presented this image; that they would have taken into account the very poor angular resolution before making a claim of a concrete find. Or at least proactively admit the limitations of or possible problems with their data when they present it. This article gives me a lot to think about. With this new information, I agree that the WMAP & COBE data are very debatable. Even the background data to the ‘north’ and ‘south’ of our galaxy’s data (once our microwaves are truly and completely calculated out) is very debatable with no real data or resolution of all the other galaxies’ microave data to calculate out as well. I wonder if, when we finally manage that, there will be anything left to see. I do think we will get there, and with higher resolution, perhaps we will find a much fainter signal than we are seeing in any of these, but it seems plausible we won’t find anything – and wouldn’t that be interesting. We certainly shouldn’t be using this questionable data in important models though, and it’s doubly disappointing to me if this is truly happening as scientists should know better. Question: What do you feel the original researchers at the Holmdel Horn Antenna were really hearing/measuring? It seems far more likely now that it was the background from our own galaxy and some faint signal from other galaxies, rather than the true CMB. I would love to hear what you think of the recent image data of Quasar 3C 279’s black hole. Thank you so much for your blog, I very much look forward to reading more! Glad to learn you found the article helpful and thank you for your kind thoughts and encouragement Nora. Let me take this opportunity to make sure you know you can subscribe to this blog for free (close to the upper right corner of most articles) and you might enjoy the Glossary of Cosmological Principles. You ask what I think the Penzias and Wilson observations at the Holmdel Horn Antenna were actually measuring. 2) they had the serious problem that our atmosphere absorbs almost all microwave radiation. More later (including a response to your question on Quasar 3C 279′s apparent black hole). You ask what do I feel the original researchers at the Holmdel Horn Antenna were really hearing or measuring? Thank you for asking. It is a simple, clean experiment. All they reported was a slight (“3.5 degrees Kelvin”) “unaccounted for” increase in radiation energy at 7.35 centimeters wavelength (or 4,080 mc/sec.). There is really very little data (essentially a single data point – across the whole sky) or analysis in that short paper. They left essentially all analysis to the Dicke, Peebles, Roll, Wilkinson team whose paper is published right before their article in the same issue and did not report any data. One could argue they only reported a single data point. That measurement was uniform across the sky, but is essentially only one data point. The paper does have a good overview of the methods and efforts to control variables. However, there is no map of the sky nor do they report any variance where the values are now known to be higher at our galactic plane. This means Penzias and Wilson did not report anything that would indicate a “background” that was any different from what is now considered foreground microwave radiation. All it has is a description that the “excess antenna temperature” appeared uniform (“isotropic”) in every direction they looked and does not vary during the year. From what we know now (hindsight is so much better than 20-20) and considering that their “camera” resolution was only 1.5 degrees (meaning the Eclipse images at Holmdel resolution would look essentially identical to the COBE image at the top of this article), I suspect you are right. To your list of foreground microwave sources I would add two more contributors that are typically overlooked – gas and plasma between and inside galaxies. Hi David – I’ve been doing a critical evaluation from an advanced layperson standpoint of just what the COBE/WMAP/Planck maps are actually showing and your excellent article, which I stumbled across via Google, does an excellent job of articulating my own doubts and concerns. I was wondering what you think about the claims by Li and Liu that the WMAP team totally blew the data processing of their data and that the huge quadrupole WMAP found is all a 26 usec timing error mismatch in their data. See http://arxiv.org/abs/1003.1073 and Google “WMAP quadrupole li liu” to find more. Thank you for bringing this fascinating article to my attention Ricky. Discover Magazine Censored my comment ! I wrote a relevant timely comment on their article Ripples in Space Are Evidence of Universe’s Early Growth Spurt – with a link to this article on Tuesday, March 25, 2014 and they refused to publish it ! This is the equivalent of putting on coke-bottle glasses, looking at Queen Elizabeth and then insisting you’ve seen Jennifer Aniston. But they censored my comment. Discover magazine refused to publish it ! I just ran across a website applauding and discussing the article. dd: While I am pleased for the attention (and the appreciation) this microwave problem is getting unfortunately, the discussion includes a long list of errors, misunderstandings and distractions. Answer 1: What ! ? That only makes sense for someone who wants to ignore CMBR’s “Elephant in the Dining-room-sized” problem. Where else in astronomy or physics would anyone argue that it is better to have less information, less resolution ? It is my hypothesis that at high angular resolution (sub arc-second) essentially all microwave sources will be revealed as foreground — galaxies, gas or dust; that when we get ‘too much’ resolution the microwave “background” will evaporate and then simply disappear as every point is revealed as a discrete foreground emitter – galaxies and stars. A 2: So which is the commenter claiming ? A: Of course Angular Resolution is not meaningless. That’s why every new experiment (WMAP, Planck) brags about their “new and improved” Angular Resolution. A: Angular Resolution and Sensitivity are co-equally important. Without sub arc-second microwave angular resolution, it intrinsically impossible to remove the microwave contribution from the millions of foreground galaxies and stars in every square degree of sky. A: I assert that to claim microwave background exists — you need both sensitivity AND sub arc-second angular resolution. But no microwave sky map has yet even come close to, within two magnitudes of, that second criteria. Comment 3: The Planck satellite was launched after the article was written, has better angular resolution than COBE and WMAP making the whole article moot. A: This is simply wrong, and indicates a failure to read the article, because the article did mention Planck’s still inadequate angular resolution and even provides recent whole sky maps from Planck. A: While Planck’s resolution is notably better than COBE or WMAP, as the article describes, each giant pixel of Planck’s map still unarguably includes the microwave radiation from thousands to millions of foreground galaxies which cannot be credibly removed or subtracted. Whether Planck’s data is better than WMAP and COBE, or even the ‘Best’ — is irrelevant. The only thing that matters is adequacy — Is it good enough ? In the case of using microwave data to conclude there is a microwave “background” the answer is sadly No – by at least two magnitudes. A: This is just a distraction. Not unlike insisting on debating Titanic deckchair arrangements while ignoring the sinking ship. Both of the other instruments, “FIRAS” and “DIRBE,” were InfraRed sensors — not microwave sensors. (That’s why they both have “IR” in their acronyms.) They were essentially trying to map dust locations to be subtracted from the DMR map. In any case, the “FIRAS” and “DIRBE instruments’ angular resolution was terrible as well making them equally meaningless for this topic. A 5: This sentence contradicts itself, likely accidentally. But there is no way to know what the commenter meant, without making many wrong guesses. A: CBR and background radiation in this context are the same thing. Since something cannot be 1000 times greater than itself, the commenter needs to explain /define his terms. A 6: Discussing whether this is a camera or not is another distraction. Nevertheless, the DMR (Differential Microwave Radiometer) was designed, operates and produces a result (images compiled for use as a map) exactly like a camera. 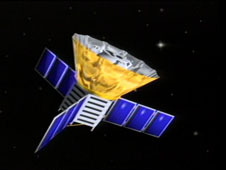 The DMR (Differential Microwave Radiometer) had two sensors that collect data exactly like any other digital camera pixels or sensels. The COBE team used that DMR data to make maps exactly like a satellite makes photographic maps from orbit. That pretty much makes the DMR a microwave Camera – with only two (highly sensitive) pixels (and appallingly bad resolution). Comment 7: All images are calculated in modern cameras. A 7: This is yet another distraction. While it can be argued that most digital camera images are a result of calculation, that intentionally avoids or confuses the point. Such a microwave film camera would use no calculations. That is essentially what the original microwave sky map did; the Holmdel Horn / Penzias-Wilson one pixel/one-reported-data-point experiment. That is why it took 5 months of computer time to calculate the first COBE “background” map, but likely only hours to create COBE’s whole sky total microwave map. A 8: “Anisotropic radiation in the background” is simply a $25 (intimidating) term for how microwaves are simply stronger or weaker in different areas of the sky. This is directly analogous with a map of landscape with higher and lower elevation areas. I would suggest — Don’t hold your breath waiting for adequate (sub-arcsecond) whole-sky microwave angular resolution data. At best it’s years away. Unless some brave soul gets time on the ALMA (Atacama Large Millimeter Array with “angular resolution of 10 milliarcseconds”) to map the Hubble Deep Field South and overlays the two maps. 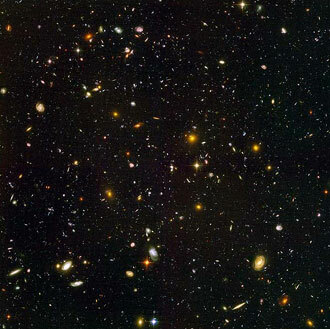 I hypothesize that the microwave map of Hubble Deep Field South would show spots of microwave radiation in exactly the same places as the millions of galaxies seen in the Hubble Deep Field South image itself – and essentially no, or very little, microwave radiation where there are no galaxies. If this indeed occurs, the whole concept of a microwave “background” will evaporate overnight. Who’s got the courage to join me in writing a proposal for this experiment ? There are two possible outcomes: I could be wrong (it wouldn’t be the first time) — or it could change the direction of Cosmology Physics – rapidly. Thanks for putting all that together, very logical, I would say you’ve proved the point. Decades ago I attended a lecture by Arno Penzias who got a Nobel Prize for the 3˚ blackbody discovery. When asked “what existed before the big bang”, he declared “Before the big bang, space, time, matter and energy did not exist”. Got that? Pure metaphysics, just like the Lorentz-Fitzgerald contraction, and Einstein’s relativity. Our physics has gone wacky, ever since the cosmic ether was prematurely discarded and erased. Am studying the work of Dayton Miller, top scientist of the 30s and 40s, who did the best job of measuring the ether-drift, proved it was so. All he got for his painstaking work was a stick in the eye. Thank you for your encouraging comment JD. One thing that always stuns me about the Penzias-Wilson Nobel – their paper described exactly one data point.